Probashbangla24 online Desk : BNP-led 20-party alliance is going to sit in a meeting on Monday evening to discuss its next course of action. 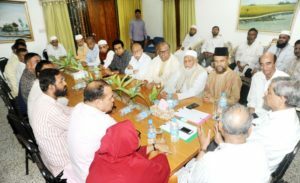 The meeting will take place at BNP chairperson’s Gulshan office from 6:30pm, said Sayrul Kabir Khan, a media wing member of BNP chairperson Khaleda Zia. BNP has formed another alliance with Dr Kamal Hossain-led Jatiya Oikya Prokriya, Jatiya Samajtantrik Dal (JSD-Rob) and Nagorik Oikya just two days ago.